I remember how frustrating it was when I was trying to conceive a second child. It seemed like it would never happened. My friends had no issues at all conceiving and I felt really alone. Infertility affects many Canadians with one in six struggling with infertility. Many also feel alone the way I did as they watch their friends and family have no problems conceiving a child. I prayed for it to happen naturally as there was no way I could ever afford expensive IVF treatments. In fact, only 15% of Canadians battling infertility can afford IVF treatments and other assisted reproductive technologies. I wasn’t alone there. I’m very excited to announce that a new and innovative fertility product is launching in Canada! The Stork by Rinovum Women’s Health is an over-the-counter, at-home aid that supports a natural and intimate approach to conception. Combining science and innovation, The Stork takes the well-established cervical cap insemination technology that health care professionals have used for decades and allows couples to perform it easily in the privacy of their homes. If The Stork was available to me 10 years ago, I would have definitely given it a try. You can find it at select pharmacies across Canada. 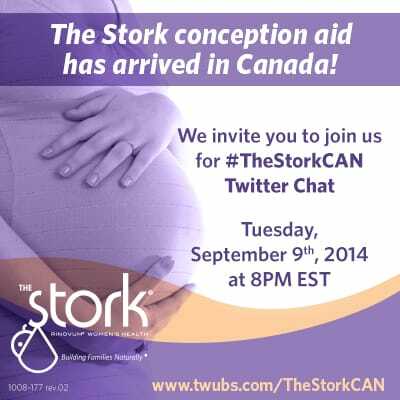 To celebrate the launch of the product, there will be a #TheStorkCAN Twitter Chat on September 9th at 8:00 PM EST! You also have a chance to win 1 of 10, $50 gift cards so don’t miss out! If this is your first Twitter Chat, it is easy to participate on the Twubs Page. 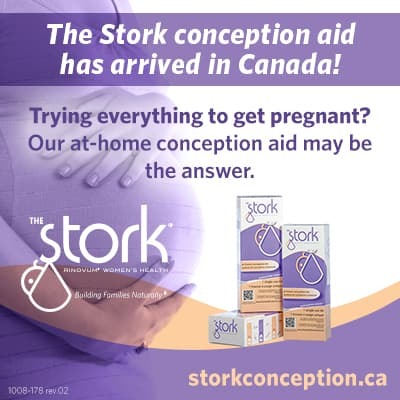 Connect with The Stork on Twitter, Facebook, Pinterest and YouTube. I would have tried this 18 years ago. It took us 10 years of trying to get pregnant and then went through the IVF program, success had twin boys.